A bombing of Borussia Dortmund’s team bus was carried out by a man using leveraged options to bet against the club’s stock, prosecutors say. A similar unsuccessful plot recently involved U.S. retailer Target. The mix of financial weapons and real ones is a disturbing new trend. 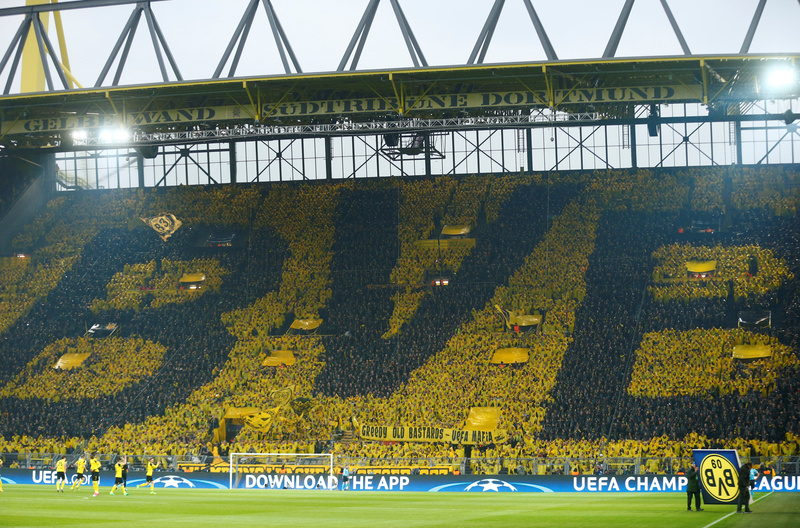 General view of Borussia Dortmund fans before their game against AS Monaco on April 12, 2017. German police arrested a man on April 21 for detonating three bombs near the Borussia Dortmund soccer team bus and seeking to profit by placing bets against the company’s stock. The man, 28-year-old Sergej W, bought 15,000 put contracts on Borussia Dortmund stock, according to the German prosecutor’s office. He also borrowed up to 79,000 euros to fund the bets, according to a regional government official. The bombs were detonated on April 11, and wounded two people.